I hope you all had a fantastic weekend! My weekend included indulging in Game of Thrones and GIRLS (June favorites…? ), Barbecuing, junk food eating, reading (400 pages in in A Game of Thrones! ), enjoying the sunshine and spending time with the boy (it’s so nice to have him home!!). 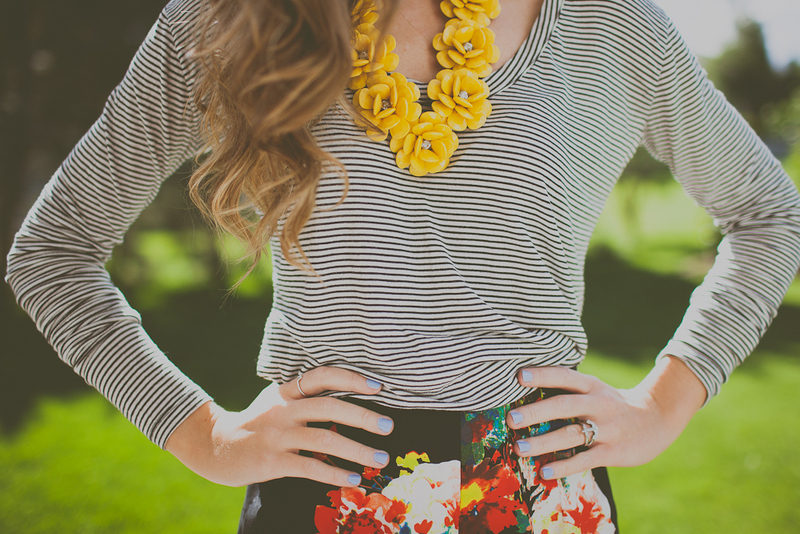 Pairing stripes and florals is a must. They compliment each other so well that it just feels meant to be! This top from Brandy Melville is my most favorite thing everrrr. It’s ridiculously soft and comfortable and fits perfectly. I’m not going to lie, I practically wore it every day this weekend. Oops! But I mean seriously, it goes with everything and it’s just so comfortable! It’s sold out online now, but for future reference, it’s the Farrah top:) Pairing it with floral shorts and my JCrew knock-off necklace, I felt like Rainbow Brite, and I’m totally digging it. I love these shorts! I have the same necklace in white and it goes with everything! Haha, love how these turned out as well Ashley, you are looking gorgeous as ever and totally fun and stylish. Loving these shorts! Also sounds like the perfect weekend. 400 pages?? Dang, I need to get my act together. I've been letting my books collect dust. you look super pretty. i adore the shorts. These shorts are fantastic. I love how you went extra bold with the necklace! WEL HAY MISS FLORAL how you doin' on this beautiful sunshin-y day?! 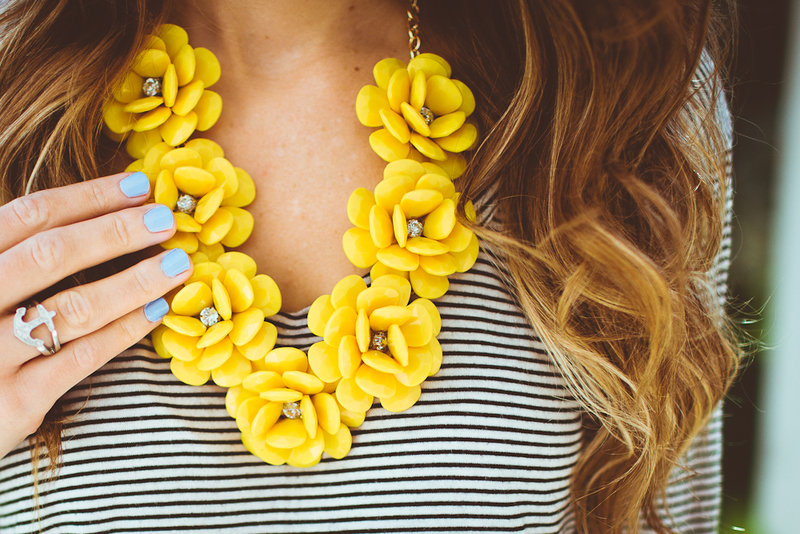 Your necklace is a stunner. 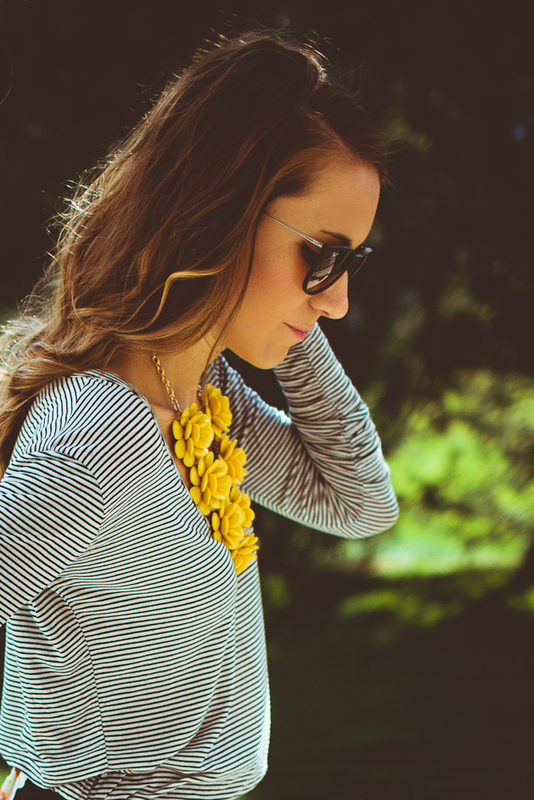 So bold and yellow and FLOWERY-POWERY against your stripes. I am almost considering buying that haha–it looks like such a good statement piece for an otherwise casual outfit. That last photo is so model-esque, by the way. Work it, Ashley. && your weekend sounds like it was heavenly. Getting into that GoT I see, haha! I'll have to take your advice and watch the series first and then maybe see if I can get into the books. Stripes totally go with everything, so I can see why you just had to wear them. But I'm inlove 2with your shorts! perfect for summer. and yep, you're right, the photos are so nice. i love how the colors turned out. Everything about this outfit is gorgeous! I really love the top paired with the shorts and the little pop of yellow is a really nice touch. 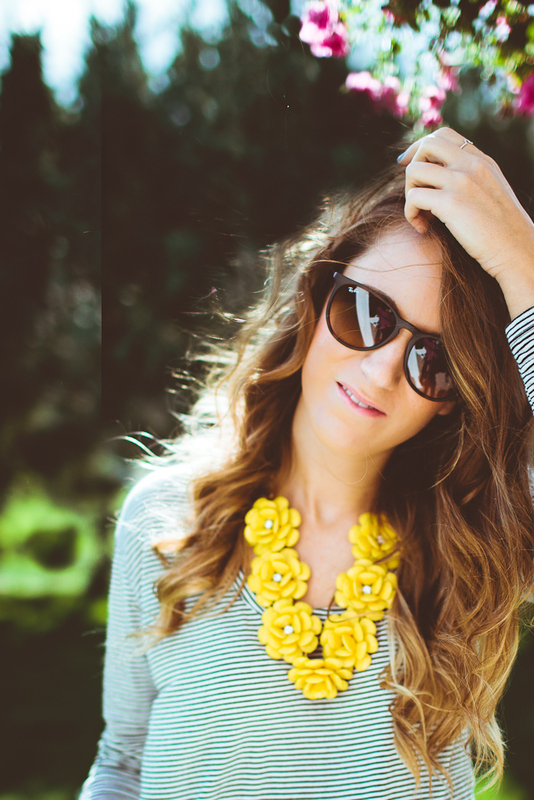 Great add with that lovely yellow necklace. Ummm this outfit – amazing!! Love the mixed prints, the gorgeous floral print of your shorts (so sad they're not still available) and your perfect J. Crew inspired necklace! Love love love. Oh my gosh I LOVE this outfit! I think everyone who has commented totally loves it at as well! I just found your blog and I am so, so happy! I love your style. You are radiant in these photos! 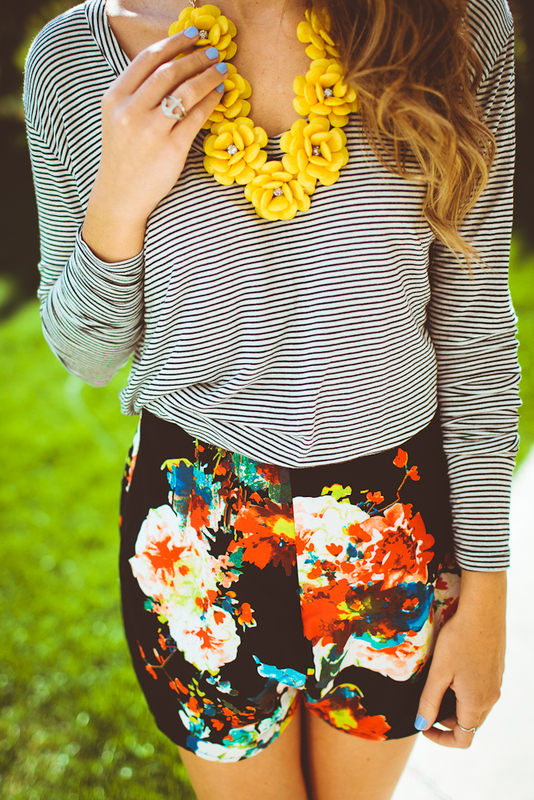 Love the bright floral on those shorts, perfect with the statement necklace. can you please check my blog and follow back?? I feel like I should start on either reading or watching Game of Thrones, it looks so interesting! And your sister did such a great job on these photos, I can never get good photos in direct sunlight. How did she do it?? i love your shorts! gorgeous outift! You're so cute! I love your young, fresh outfits! 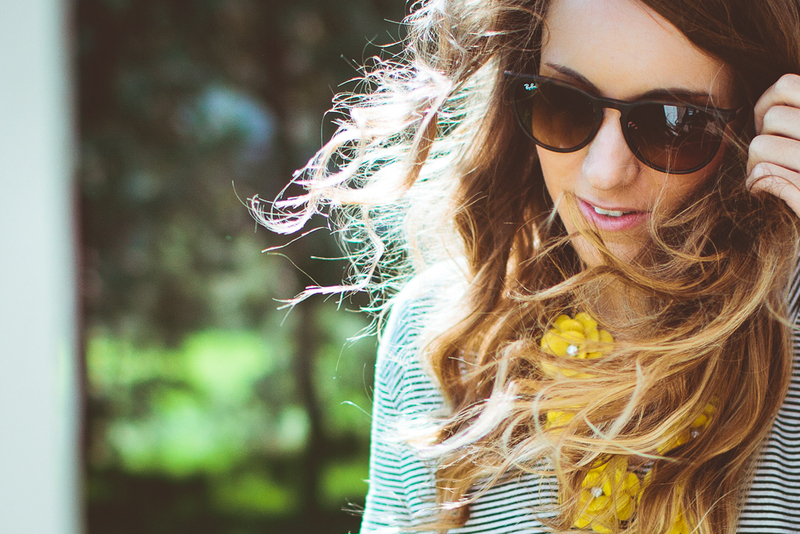 Following you and can't wait to see more great style ideas! OMG! So I love love love your blog, and as soon as I saw this necklace I HAD to have it! But I saw on Groopdealz that its back and only 14.99 plus free shipping!! You gotta check it out! Hey I just started following you on Bloglovin' as well, hope you can do the same!